Dear Lord, help us to ALWAYS be ready to answer the call to prayer--and to respond immediately when it is urgent! Thank You for giving us a small peek this morning into what happens when we are obedient to Your call. May we press in even further throughout this entire weekend, every time and any time You call us--until the Day You call us Home. Amen. Dear Heartdwellers, Clare, Ezekiel and I were given a strong call to prayer this morning. And the Lord allowed me to 'see' a little of just what was happening. We are sharing this now with you to encourage you that, Yes! Prayer REALLY DOES MATTER! I know I struggle with it sometimes, wondering what all 'difference it makes' when I can't tell what's going on. But Jesus is so kind, always. And this morning, He gave me a glimpse into the warfare going on before us, and a word for ALL of us. When the Lord intentionally shows me the number 5--it always means 'prayer is needed--suffering is about to come. Get ready!' And at exactly 11:05, I got an urgent phone call from Clare. Ezekiel had been called into a period of suffering for the Lord. Clare left the phone with Ezekiel and I, that we could join in prayer, while she went to sound the alarm on the Channel - the messages she has already put up for you. I quickly texted our Prayer Warriors to come and join in prayer. And Ezekiel and I pressed in, praying in tongues. Ezekiel told me that he had a recording of the rosary to play in the background at his home. I put on a recording of the Mercy Chaplet at my prayer desk. The Lord has taught us in the past that there are times when doing this is much needed. Our tongues are, in essence, 'backing up' the power of the rosary prayer and the Chaplet. Soon, Ezekiel saw the purpose: three men had been assigned to assassinate Donald Trump. They were trained snipers, being assigned from the Deep State, and had taken up positions against him--waiting. They were waiting for something that was to happen between 11:00 and 12:00 noon. Their intent was to so riddle the President's body with bullets that he could not possibly survive it. Satan and the devils knew today would be a HIGH day of distraction. It's Black Friday. Even Jesus' Bride might possibly be tempted. Strongly. To want to 'take advantage of the deals' today. Maybe thinking that today would be a frugal and wise time to use their money, and make choices to purchase, looking towards Christmas. This would be a good thing. Right? How crafty and subtle he is! How easily he can convince us to turn our attention away from the Lord, even thinking we're doing a good thing. How careful we need to be in our discernment! I was even fighting it this morning. I had a thought in the middle of my prayer & journalism time, and I stopped to ask through the Bible Promises what I should do about a purchase my husband and I had been thinking of making for some time now. But, my readings were inconclusive. It wasn't 10 minutes later that Clare called me. Thank You, Lord--that I didn't 'dive in' and get wound up being confused over the readings, or in pursuing things any further. By 11:15, Ezekiel had been shown by the Lord that this Battle would be needed right up to 12:00 noon. And he began to see the men and what was happening. He was told two of the men's weapons had been disabled at this point. And I began wondering just what might have happened to jam them--when the Lord opened my eyes. Standing, though, in front of this man was a large angel, half again as tall as this soldier. And the angel (and this made me laugh, right out loud! I'm sorry...) had the index finger of his right hand stuffed into the end of the barrel of the gun! He was just standing there, very unperturbed by the whole situation... Just standing there. Looking at the man. Waiting. Like I said, this literally made me laugh out loud! But then I looked at the man. His face was filled with fear and confusion. And suddenly, Ezekiel said to me, 'He's afraid for his life. This was an assignment--do or die.' And my heart immediately turned to prayer over this man's soul. Ezekiel told me that the situation seemed to be ramping back down again, so to speak. His pain level was lowering. My pain level was lowering, and we could both feel a sense of Peace started to flow around us. One soldier's gun was still enabled. I don't think he was aware of his fellow soldiers, or what position they had been placed in. Ezekiel spoke again, "The Lord is playing with the devils now. Showing them, again, just Who is in charge of all these things." And He assured Ezekiel that He was going to bring this situation to a safe conclusion. I looked once more at the angel and 'my' soldier. The angel's finger was still in the man's gun barrel, but I could see his face now. The angel's. He, too, was looking at the demons working against this man. I could feel his power. His face was stern against those devils! Yet he had a look of great compassion for the soldier himself. Just watching all this made me cry out to Papa God again, "Papa! Mercy on this man's soul, please? He has no idea what he is doing. He has no idea who he is serving. Please, Papa! Have Mercy on him. Open his eyes to the Truth of who he is obeying. And the Truth of Who You are." And Jesus began to speak to me then. He said, "I have called on you--and you have done well, Love. My two. Press in a little longer--until 12:00. I have called, as you have asked. Our Donald will be safe, I have ordained it. Thank you, My Treasures. ALL of you. My dear Treasures..."
Now, to explain what He was saying there, when Jesus said, 'I have called', He meant that He had called out to Papa God and the angels--in response to all of our prayers. Both Ezekiel and I, and Clare's. The Prayer Warriors. And all of you, Heartdwellers, that had received the call already. He addressed me first, and then Ezekiel, but then as He spoke, His intention flowed out to ALL you. All of you. As Ezekiel and I discussed this a little later, we were reminded that Jesus is OUR intercessor! As we call on Him to help us, He goes to the Father with our and His requests. We had momentarily 'forgotten' this aspect of what He does for us and with us. Jesus continued to say to me then, "Yes--I have shown this soldier just Who he is facing--and Holy Spirit is now opening his eyes. Whether he accepts or not is not to be told just now. Pray for this man again, as Holy Spirit encourages you to, as He reminds you to. He will come into My Kingdom--this is My promise to you. I will draw him. My Mother will woo his heart away from the 'guns and glory' that he has known most of his life. She has been 'digging around the base of this tree' for many years now. "Thank you, My Beloveds. Thank you for responding with Love and Compassion." Now, we've been told that Mother Mary is the one who often asks to do this for a soul. One who has hardened their heart against the Kingdom. Or, one whose heart has been hardened against the Kingdom by the way they lived. Or the family they grew up in. Or...just the people they've been around so much of their life. She goes to them in her motherly way, praying for them and encouraging them. The image in my mind as I write this is of a child who needs to take a spoonful of bitter medicine. Something they don't want. Sometimes it has to be a mother's soft and gentle touch that can convince the child to open their mouth and swallow. Life for people can be so difficult, so much against them. Walls build up around their hearts, hurts and wounds and deceptive teachings harden them against considering God as a Good and Kind Father. And then the enemy comes in and convinces them that he has more power. That he will give them more rewards. And the image and the concept of Who Jesus and God really are fades and fades away. And so, Mary will go to the Father and ask Him, "Please. Let me give it one more try?" And so, this message is for all of us, Heartdwellers. He thanks you for all of your dedication to prayer. He thanks you for your love for His children and the ones we're trying to draw still into the Kingdom. And He urges us, for this entire weekend specifically, to yes. Continue to press into prayer. Continue to press in to prayer when He calls us. I was about to put this message into a video and I went looking for a picture. Clare had already given me one, but it was more of a generic, everyone called to prayer. The saints called to prayer...and Holy Spirit stopped me. And He made me reconsider...this wasn't just about Our Donald. Our President. This was about this soldier. This was about those who are working for the wrong Master. 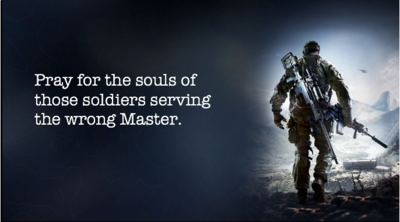 And so, He gave me the title to this: For the Sake of a Soldier's Eternity. And I would urge you to think of that, too, as we pray. We want prayer and protection, not only for the good in our life. The good people, people doing the right things for our country. But oh, we must turn our prayers for the sake of those who just...don't know better. They've been deceived. They've been lied to. They've swallowed the lie hook, line and sinker. I wanted to add that in here before I stopped. Thank You, Holy Spirit.